Every year, something or the other has happened, keeping me from making it to the Old City during Ramadan nights. Finally, some stars somewhere aligned in a certain way, plans worked out and I found myself in Old Hyderabad for what was branded as a Sehri Walk. To the unenlightened, Sehri is the meal taken shortly before daybreak by fasting Muslims during Ramadan. The idea of the Sehri Walk was to spend a night wandering around the Charminar area in Hyderabad, ending with some Sehri food. The group that gathered was about 50 strong and, in good Hyderabadi tradition, we started walking at about midnight, having been scheduled to start at 11 PM. Our starting point was the Badshahi Ashoor Khana, a fantastically decorated mosque that is the venue for Moharram rituals every year. Situated right next to the Badshahi Ashoor Khana is the famed Shadab Hotel, home of one of Hyderabad’s top biryanis and, during Ramadan, one of Hyderabad’s best haleems. If you do not know what a biryani or a haleem is, please look it up – I’m afraid if I try to describe either of them, I will be left with a burning desire to eat them immediately and this post will never be finished! Just before we gathered for the walk, my friends and I went to Shadab and quickly had some haleem. As with the biryani, there will be many who argue they’ve had better – it only shows that you are spoilt for choice when it comes to biryani and haleem in Hyderabad. We thoroughly enjoyed it – it was well-smashed, very mildly spiced (though apparently more than Pista House’s), and with the appropriate application of the various toppings, a nicely rounded dish. We ate it as haleem should be eaten – standing by the street side, scooping it out of a flimsy styrofoam plate with plastic spoons. Within minutes our haleem craving was well-satisfied – the healthy dose of ghee in which it was cooked ensured that. We spent a good 20 minutes blocking all access to the Badshahi Ashoor Khana while our fearless leader and walk guide, Gopal, organized us into groups (so we would not get lost), appointed group captains (to ensure each group did not leave part of itself behind) and set the ground rules for the walk. From the Badshahi Ashoor Khana, we made our way to the European Darwaza, walked along a narrow lane and turned into the Rajasthani Darwaza, which put us bang in the middle of Chatta Bazar, a lane filled with calligraphy shops whose bread and butter was printing wedding invitations and related communications. We walked on to the Chatta Kaman and then back to Patherghatti Road. While the Darwazas are mere arches waiting to collapse or be encroached upon today, once upon a time they were different entrances to the palatial grounds of the Salar Jung family, hereditary prime ministers to the erstwhile Asaf Jahi rulers of Hyderabad. Our next target was to get to a restaurant called Shahran, which we had to do by walking past the Bridal Bazar, Patherghatti and Burqa Bazar. All of them mean exactly what they say – shop after shop sold all manners and varieties of burqas in Burqa Bazar, while the Bridal Bazar had – surprise surprise – all things bridal. What was not said was that across from the road from the Bridal Bazar was the Bridegroom’s Bazar, where shop after shop sold things a bridegroom might need. Now, there has to be a word about the ambience of the walk. Well, a word wouldn’t suffice, nor two nor ten nor a hundred. But I’ll try. The place was brightly lit. When I say the place, I mean the whole place including the streets and alleys. Large banks of strategically placed metal-halide floodlights magically turned night into day. That ensured you are blinded. Thousands upon thousands of men, women, children, bikes and autorickshaws jostled for space and air in every nook and cranny of the Charminar area. Since it was so crowded, the normally reticent Hyderabadis left their discreet voices at home and screamed instead of speaking. Since the streets were choked with pedestrian traffic and the sidewalks with vehicular traffic, all motorists passed the time by peaceably testing their horns, and once convinced nothing was wrong with them, promptly stress-testing them. All that ensured you were deafened. When you put that many people in that close quarters, more than a little bit of personal place is invaded – doing anything without at least five other people being in physical contact with you was something to be celebrated. All this closeness meant your sense of smell did not feel ignored – in fact it was so not ignored that after a while all the various aromas blended nicely into a medley of human and animal faeces and open sewers. Between the crowds pressing in on you and their redolence, you were ensured of being tactilely and olafactorily overloaded. To describe it as an assault on your senses would be like calling the meteorite that wiped out the dinosaurs a pebble. We braved on, sleep and hunger forgotten, like salmon swimming upstream when the dams have been breached after a particularly hard monsoon in the hills, and very soon we were at Shahran Hotel. Here, we hungrily ordered a slew of dishes from the various menus plastered on all the walls (what good is wallpaper if you cannot print something useful on it!). The waiter listened amusedly to us before informing us that the only thing we could have right away was the seekh kebab. Everything else would ‘take time’, a euphemism for ‘not available.’ We figured this out when we asked him how much time and he started going, “Ten minutes, fifteen minutes, twenty minutes, half-an-hour…” He actually vocalized the ellipsis – I swear. So we were smart and ordered the seekh kebab – we were unsure of the size of the dish so we asked for two plates between us. When it arrived, we realized there was an extra ‘h’ in the name of the dish. It should have been called a seek kebab – because that is what you had to do in order to find it on the plate! In a plate as vast as the Serengeti, four tiny pieces of kebab were rolling around, surrounded by a sparse salad of onions and a slice of lime. It was not quite the Great Migration, but we did have a safari-like experience spotting the wildebeest. I mean the kebab. When we found them and managed to taste them, we found them quite tasty, and within a few seconds the Serengeti had morphed into the Kalahari – bereft of kebab, salad and even the slice of lime. So we ordered two more plates which met with a similar fate. After paying the princely sum of Rs. 400 for our miniature Serengeti safaris, we decided to try our luck elsewhere and headed out. We plunged once again into the human river and made our way to a roadside stall where we obtained sugarcane juice and tender coconut water, which partially quenched the fires that had been aroused by our reaction to the price of the measly kebabs at Shahran. The entire group then adjourned to the Crockery Market where, thanks to the patronage of an old security guard keeping watch over the place, we managed to find a place to sit on the ground and rest our legs. Gopal then regaled us with stories of Hyderabad history. We resumed our walk and made our way to Gulzar Hauz, which to my great disappointment was not a house but a fountain situated at a crossroads. On each of the roads around Gulzar Hauz is a kaman, or a masonry arch. After much speculation on what could be the reason for naming one of them Machli Kaman – which translates as Fish Arch – we moved on to the much more interestingly named Sher-e-Batli Kaman. Apparently this translates as Arch of the Lion-hearted, and was once covered in gold and studded in diamonds. It’s a bit tumbledown now – covered in nothing and studded with ficus plants. 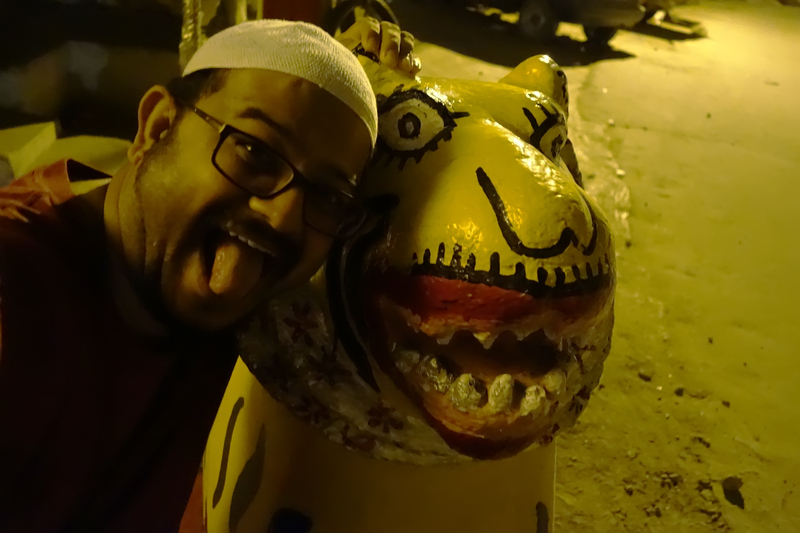 Nevertheless, it led us to the absurdly delightful dentists’ nightmare that is Mitti ka Sher – a masonry tiger that sits patiently by the roadside, enduring generations of mutilations as ‘artisans’ keep ‘renovating’ it. If you thought Ecce Homo was bad, you haven’t seen Mitti ka Sher, which translates as Earthen Tiger. Off to one side of the freckled feline is that butter-wielding butcher of dosas popularly referred to as Govind. The arch directly opposite the Sher-e-Batli Kaman is called Khaali Kaman – Empty Arch, or in Hyderabadi, Just an Arch. Apparently naming the Sher-e-Batli sucked out all the naming ability out of them that they just gave up and called the opposite one Just an Arch. We took the narrow street next to the terribly-toothed tiger, walking silently past the houses of the sleeping Marwadis – I’m not being facetious here. The lane was called Marwadi Gali and hence the reference to sleeping Marwadis. We stepped into Laad Bazar and from there followed a garbage truck to the side entrance to Mecca Masjid. We sat on the steps to the side gate while Gopal competed with the garbage truck’s noises to narrate a few more tales. A couple of photographically-minded participants were convinced by Gopal to attempt a group picture. This naturally aroused the curiosity of a few toothbrush-wielding locals, one of whom sought to satisfy it by sticking his metal-brimmed-baseball-cap-covered head, complete with moving toothbrush in mouth, into the frame. After a few moments of hilarity, everyone gave up on the group picture (or it was completed, I cannot remember which) and we headed to the Unani Hospital. After some picture taking of the Charminar and the Mecca Masjid from within the Unani Hospital, we made our way to the penultimate stop of the walk. This was the Khilwat Ground, outside the clock tower of the Chowmahalla Palace. We had one more round of stories from Gopal, this time interrupted by the azan. After the stories were done, we went on to Rumaan for a spot of Sehri food. This turned out to be the khichdi with khatta keema – lentil rice with a ground beef gravy. The walk ended there, with everyone shaking Gopal’s hand and promising to join the Hyderabad Trails page on a popular social networking site. We continued walking back to Govind’s, found we were thirty minutes ahead of schedule, went on to another dosa place near the Unani Hospital, had a quick dosa and a portrait shoot on a for-realsies film camera, summoned a cab and went home, falling asleep on the way. On the whole, Old City on Ramadan nights was rather like Times Square on New Year’s Eve – I’m glad I did it once and I’ll be damned if I do it again.